Mini-Factory 2pcs Bike Mirror, Universal Bicycle Handlebar Safety Adjustable 360 Rotating Rear View Mirror for Mountain Bike/Road Bike by Mini-Factory at Melon City Bike Club. MPN: MFBIKEMR01. Hurry! Limited time offer. Offer valid only while supplies last. PROVIDE SAFETY - Give you a clear view of behind you, keeping you safe from the road. 360° Degree rotating, fully adjustable, allowing you to adjust to your desired angle easily. Universal fit for bike handlebars within 9" inch, Fit for Most Mountain Bikes & Road Bikes. Made of quality materials, Mirror Size: approx 5" inch. Excellent Bike Gift. 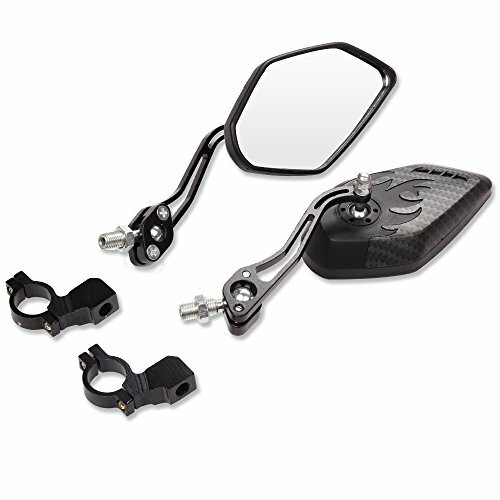 Package Included: 2pcs Bike Mirror.